Gibbs Smith, Inc. has entered into a sales and distribution agreement with Little Libros, LLC, publisher of Lil’ Libros® bilingual children’s books. This worldwide sales and distribution agreement takes effect January 1, 2018.
" ... we share the same mission of enriching and inspiring our community." Patty Rodriguez, Lil’ Libros co-founder and CCO states, "To see Lil' Libros as part of the Gibbs Smith family is a dream come true. This partnership makes me really proud as a Latina woman and mother because I am certain this will elevate our community's voice and talent." 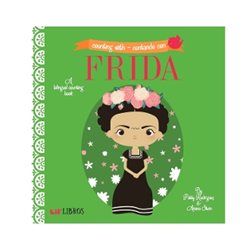 Lil’ Libros is an independent bilingual children’s book publisher, headquartered in Los Angeles. Founded in 2014, its books are currently found in Target, Barnes and Noble, Amazon and independent bookstores nationwide. Gibbs Smith is a Utah based publisher, founded in 1969. Its trade and special interest division publishes home reference, cookbook, and children’s titles. Its BabyLit® imprint publishes board- and storybooks for children ages 0-5, and its LoveLit™ Gift brand creates book themed gifts for those who love to read. The Gibbs Smith Education division is the nation’s leading publisher of state history programs.